The Prime Minister of the Kingdom of Cambodia (Khmer: នាយករដ្ឋមន្ត្រីនៃព្រះរាជាណាចក្រកម្ពុជា, French: Premier ministre du Royaume du Cambodge) is the head of government of Cambodia. The prime minister is also the chairman of the Cabinet and leads the executive branch of the Royal Cambodian Government. The prime minister is required to be a member of parliament, and is appointed by the monarch for a term of five years. Since 1945, 36 individuals have served as prime minister. The incumbent prime minister, since 1985, is Hun Sen of the Cambodian People's Party. He served from 1985 to 1993 and was second prime minister from 1993 to 1998. Elected as prime minister in his own right in 1998, he is the longest serving prime minister in Cambodian history. The position was first held by King Norodom Sihanouk in March 1945, during the French colonial administration. Cambodia's first parliamentary elections were held on 1 September 1946. The Democratic Party remained the dominant-party in Cambodian politics throughout the 1940s until the formation of the Sangkum Reastr Niyum in 1955. Sangkum was the dominant-party in Cambodia from 1955 to 1970 following a military coup by General Lon Nol. Until 1993, it was not an elected position. Merely few prime ministers were elected including Sisowath Youtevong, Norodom Sihanouk, and Lon Nol. In 1993, constitutional monarchy was restored in Cambodia. The role of the prime minister was officially recognized in the constitution. The CPP–FUNCINPEC coalition agreement of 1993 marked a brief period in Cambodia where Hun Sen and Prince Norodom Ranariddh were coequal Prime Ministers. The coalition lasted from 2 July until 21 September 1993, when Norodom Ranariddh then became the first democratically elected prime minister and Hun Sen was second prime minister. In 1997 Sen's Cambodian People's Party staged a coup that replaced Ranariddh with Ung Huot for one year until the criticized 1998 election installed Sen as sole prime minister. The prime minister is required to be a member of parliament. He first needs to be elected by a majority of parliament before a swearing-in ceremony can take place. The inauguration of the prime minister takes place at the Royal Palace. The prime minister-designate takes an oath of office in front of the monarch and the two heads of the Thammayut and Mohanikay order. A cabinet will then be unveiled. The formation of a new government takes place no more than 60 days after the election, as defined in the constitution. The prime minister is assisted by deputy prime ministers. Article 125 of the Constitution states that should the prime minister resign or die in office, an acting prime minister is appointed. The Peace Palace serves as the principal workplace of the prime minister. It was inaugurated on 19 October 2010 by the King. However, the prime minister resides at his own private residence. Article 11: If the King can not perform its normal functions of head of state because of a serious illness certified by a group of medical experts appointed by the President of the Senate, the Speaker of the Assembly and the Prime Minister, the President of the Senate shall serve as head of state in place of King as Regent. First and second vice president of the Assembly. Article 19: The King appoints the Prime Minister and the Council of Ministers as provided for in section 119. Article 20: The King receives the Prime Minister and the Cabinet in official audience twice a month to inquire about the situation of the country. Article 22: When the nation is in danger, the King publicly declared state of emergency with the approval of the Prime Minister, the President of the National Assembly and the Senate President. Article 91: Senators, MPs and the Prime Minister has the legislative initiative. Article 96: Members have the right to question the royal government. The questions are written and transmitted through the President of the National Assembly. Answers are provided by one or several ministers depending on whether the problem concerns the responsibility of one or several ministers. If the problem is the policy of the Royal Government, the Prime Minister must answer in person. The answers of the Minister or the Prime Minister are oral or written. The above answers are given within a period of seven days after receiving the questions. If the answer is oral, the president of the National Assembly may decide whether or not to open the debate. If it does not allow for debate, the answers of the Minister or the Prime Minister put an end to questions. If it authorizes the opening of a debate, the questioners, the other speakers, the minister in question or the Prime Minister to discuss and exchange views in a period not exceeding one session. Article 107: The Senate shall meet in ordinary session twice a year. Each session lasts at least three months. At the request of the King or the proposal of the Prime Minister or at least a third of its members, the Senate summoned its members for a special session. Article 111: The Senate hearings are public. The Senate may meet in closed session at the request of the President or at least one tenth of its members, at the request of the King, at the request of the Prime Minister or at the request of the President of the National Assembly. 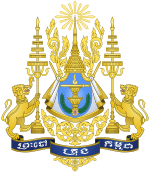 Article 118: The Council of Ministers is the Royal Government of Cambodia. The Council of Ministers is headed by a Prime Minister, assisted by vice prime ministers and ministers of state, ministers and state secretaries as members. Article 119: On the proposal of the President and with the assent of the two vice-presidents of the National Assembly, the King means a person among the members of the winning party in elections to form the Royal Government. The person appointed, along with colleagues who are MPs or party members are represented in the National Assembly responsible for ministerial posts in the royal government, seeking the confidence of the National Assembly. When the National Assembly voted confidence, the King signs the Kret appointment of the entire Cabinet. Before his grafted in office, the Council of Ministers shall take an oath under the terms provided in Annex 6. Article 121. All members of the Royal Government are collectively responsible to the National Assembly of the general policy of the royal government. Each member of the Royal Government is individually responsible to the Prime Minister and the National Assembly of the acts he committed. Article 123: The Cabinet meets every week in plenary session or work session. The plenary session was chaired by the Prime Minister. The Prime Minister may delegate to the Deputy Prime Minister chairing meetings. All minutes of meetings of the Council of Ministers must be forwarded to the King for his information. Article 124: The Prime Minister may delegate its powers to deputy prime minister or a member of the royal government. Article 125: When the position of Prime Minister is permanently vacant, must be carried to the appointment of a new Council of Ministers as provided for in this constitution. If the vacancy is temporary, an acting Prime Minister is temporarily appointed. Article 140: The King, the Prime Minister, the President of the National Assembly or one tenth of the deputies, the President of the Senate or one quarter of senators, may refer the laws passed by the National Assembly to the Constitutional Council for review before promulgation. The Rules of Procedure of the National Assembly, the Rules of the Senate and the organic laws must be submitted to the Constitutional Council for review before promulgation. The Constitutional Council shall decide, within 30 days on the compliance or non-compliance of these laws or rules of the Assembly and the Senate with the constitution. Article 141: After enactment of a law, the King, the chairman of the Senate, the president of the National Assembly, the Prime Minister, one quarter of the Senate, one tenth of the deputies or the courts may ask the Constitutional Council to determine the constitutionality of this law. A citizen has the right to challenge the constitutionality of laws through the Parliament or the President of the National Assembly or the Senate or the President of the Senate as provided in the preceding paragraph. Article 148: The National Convention meets once a year, in early December at the call of Prime Minister. The national conference is held under the chairmanship of the King. Article 151: The initiative of the revision or amendment of the constitution belongs to the King, the Prime Minister and the President of the National Assembly, on proposal of one fourth of all members of the Assembly National. Revision or amendment of the constitution must be done by a constitutional law voted by the National Assembly by a majority of two thirds of all members of the National Assembly. The Deputy Prime Minister (Khmer: ឧបនាយករដ្ឋមន្ត្រី) serves as the deputy to the Prime Minister of Cambodia and is the second highest position in the Cabinet. As of September 2018, there are 10 deputy prime ministers. As of April 2019, there are four living former prime ministers, as shown below. The most recent death of a former Prime Minister was that of Pen Sovan on 29 October 2016, aged 80. ^ Willemnns, Alex (4 November 2014). "CNRP Reveals Kem Sokha's Monthly Salary". The Cambodia Daily. Retrieved 5 September 2018. A lawmaker with no committee responsibilities takes home a $975 salary, but allowances (including $500 for gasoline) boost the figure to $2,650. ^ "36 Cambodian Prime Ministers since 1945". Khmer Times. 21 August 2014. ^ http://rulers.org/rulc1.html Retrieved 7 September 2014. ^ "Cambodia's proud history of building art". The Phnom Penh Post. 13 July 2012. Retrieved 5 September 2014. ^ "Ex-Prime Minister Pen Sovann dies at 80". The Phnom Penh Post. 31 October 2016.